This new product line of inverters converts 12V-DC, 24V-DC or 48V-DC energy from battery (within an PV Off-Grid system) into clean, stable 110V-AC or 230V-AC power, that is ideal for powering demanding home appliances. Phocos inverters are designed for high efficiency. Integrated advanced microprocessor technology combined with pure sine wave output makes them the perfect choice for use with high-end electronics and electrical equipment. Thanks to their low weight and long lifespan, the SI series is also ideal for mobile and outdoor applications (e.g. RVs, cars, and many more). An extra advantage: THD < 3 %. 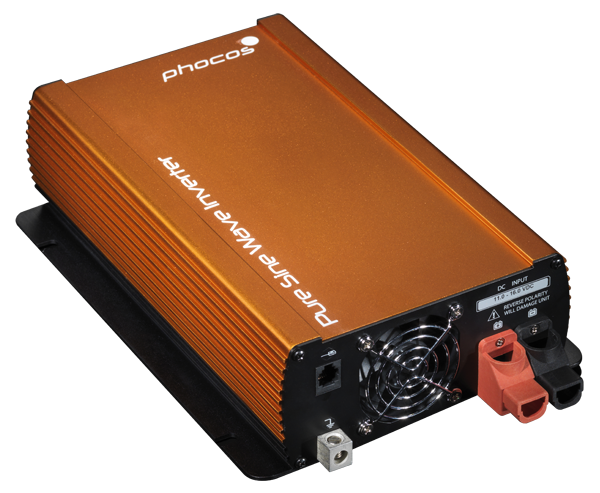 As a special, high-performance benefit, Phocos True Sine Wave Inverters offer a THD (Total Harmonic Distortion) of less than 3 percent, providing top performance and superior efficiency. Overload, short circuit, DC over/under voltage, and overheating protection are standard on all models (350/700/1500W). Now, even typical home appliances (supplied from AC outlets) can be powered by small solar home systems (12-48 voltage range). Please choose one of the available DC input and AC output parameters. Within the SI-700 series are 6 different devices available, separately for specific parameter (12V/110V, 24V/110V, 48/110V and 12V/230V, 24V/230V, 48V/230V). See product data-sheet. 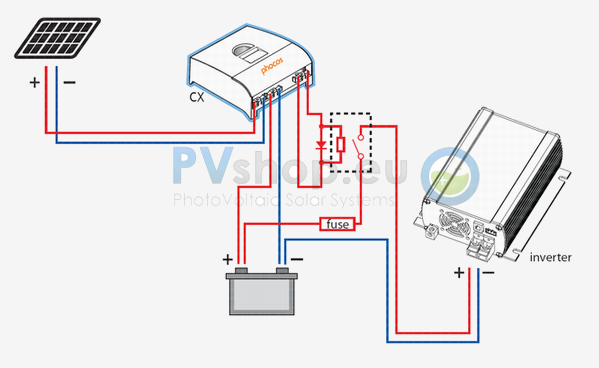 Diagram of the pure-sine-wave inverter, within an PV Off-Grid system.